Games you can't remember the title of. Of the Tabletop, and other, lesser varieties. Has suggestions for the murderers out there. Re: Games you can't remember the title of. * Environment: you had to build a city, which included building stuff like car dealers. I remember that you could build "vacation stuff", in particular there was an object with the heads of the easter islands. Holiday Island? Never saw any Easter Island heads. Included car rentals, though. Changes its form depending on the observer. Yes that's it! Thank you! * Background: I played it with my older brothers , but its a single player game , used to watch eachother. Neither the 3 of us can either remember. Would love to play it now that im older and capable lol. * Environment: Medieval RPG? i remember at the beggining of the game killing , almost an ostrich or some other weird animal with a club you find, and you continue to walk down a opth across a small stream , and then enter a castle. Antoehr detail i remmeber , was that there was a console command it mustve been , that allowed you to take control and play as a NPC IE. get their stats weapons armor and things like that. I used to do this and enter the arena in the city as i was very young , and didnt really play all to well. You could also do the same with monsters (i remember one of my brothers had a game save as a fire or frost elemental , and everyone would attack you if they seen you) The game is similar (from what i remember) as a old school skyrim or kingdom come deliverance. Did you control a party of adventurers? Lands of Lore 3, Might and Magic 8, or Arx Fatalis? Maybe just a knock-out punch?.. Totally, colipong7, is this game titled "Gothic" ? 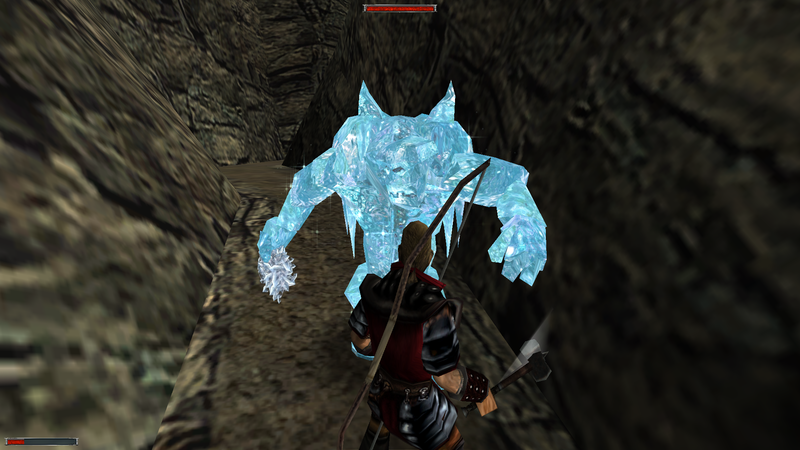 * Gameplay: You had to move around a maze of rooms (one square moved per press of arrow keys). When you move you leave a path behind that you can not cross again (i.e. Tron-like). There were coloured teleporters and I think you needed to collect keys to unlock doors. I think you may have had to walk across every square exactly once to complete the level. Probably not it, but "The Misadventures of Sir Randolph Doogleberry, British Explorer"? Inserted smaller, one-time puzzles like this in other games (Knights of the Old Republic, for example). Never found a name for this type of puzzle. May not help with searching, admittedly. Requires others to know the name too. Wow! I think that game fits the description I gave better than the one I remember! I remember the graphics being slightly better than this, and the puzzle I saw seemed to consist of a number of almost independent rooms with one wide corridors between the rooms, while this one seems just to have the tiles and no surrounding walls. I tried searching (without success) before posting here, trying terms like Hamiltonian/Euler path or travelling salesman or tron-like, but I don't know the official term for this kind of puzzle. wavelette wrote: I don't know the official term for this kind of puzzle. It doesn't appear to have a universally accepted name. I suppose it's mostly a derivative of the classic Knight's Tour puzzle. Personally, I'd call it a "single-use tile destruction maze" game, or "walky smashy smashy crumbly tile puzzle", to give it its proper Latin taxonomy. Closest thing I could find is a small indie game called Marbles Deluxe, but like Pyramids of Ra, it has the maze grid floating in a void, rather than containing corridors and 'surrounding walls'. So here I am trying to figure out an old cd game for my mom. Don't have my hopes up but well see. Oh wow, that is *not* a game improved by the use of realistic graphics. Called SQL wars, or something. Slogan was something like "Tired of games that are just a thin veneer over a database? This game gets rid of the veneer!" * Background: Interesting meta-concept, fascinating in the purity of gameplay and the transparency of implementation. * Mood: Meta-mood is snark, but mood of continued gameplay constructive turning int is ruthlessly opportunist/ adversarial. * Genre: Click and wait real time. * Gameplay: You have one or more rows in the database. Rows have money, fuel, attackers and defenders, as well as multipliers for those things. Money and fuel are generated by the passage of time * multiplier. Money was spend on improving multipliers or building new rows. Fuel was spent on attacks. You could attack and rob other rows. The thing about recursion problems is that they tend to contain other recursion problems.